Andover Fabrics Downton Abbey Tea Party + Giveaway! I had a little panic moment when my pictures from this event would not download from my camera card to my computer! Fortunately, I found a workaround and I was able to retrieve the pictures – yea! Last weekend, I was so excited to be able to attend a Downton Abbey themed tea and trunk show by Andover Fabrics and hosted by Fabric Depot. This was a ticketed event that had been scheduled for the weekend before but got postponed due to a snow and ice storm in Portland. Each place setting was beautifully decorated and we could choose between a Creme de la Earl Grey tea or a Forest Park tea. I went with the Earl Grey and it was delicious! We also enjoyed delicate little bite-sized treats to go with our tea! During the tea, attendees were invited to show a panel of judges any sewn creations that they had made using the Downton Abbey fabric line by Andover. I saw many beautiful and elegant dresses, hats, and bags that definitely fit the period of the show. Since I don’t really sew garments, I decided to create a little table topper using the Rock Candy pattern by Jaybird Quilts. You can read about it in my earlier post here. I believe that I had the only quilty type project to show the judges. Towards the end of the tea, the prizes were announced and I won second place (most creative) for my little table topper! 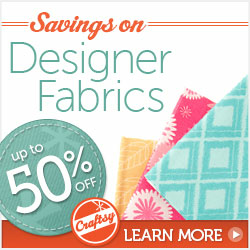 The prize was a $50 gift certificate to Fabric Depot that I, of course, spent when the tea concluded. I had so much fun at this event and found myself purchasing more Downton Abbey fabric! I want to make a bag and possibly a small quilt wall-hanging. The trunk show included some completed quilts and bags using the fabric line. I took a few pictures so you could enjoy all of the wonderful creations. Fabric Depot has posted a summary of this event with more photos on their blog here. There is a picture of my hands and the judges’ hands holding my little table topper about half-way through the blog post. And now for the giveaway! To enter the giveaway, just leave a comment on this post. Be sure that I can contact you if you win! The giveaway will be open until Monday, February 24th at 8:00 a.m., Pacific Time. I’ll use a random number generator to choose a winner. If you are a follower, you can earn an extra entry by letting me know how you follow my blog. I will mail internationally so everyone can enter. 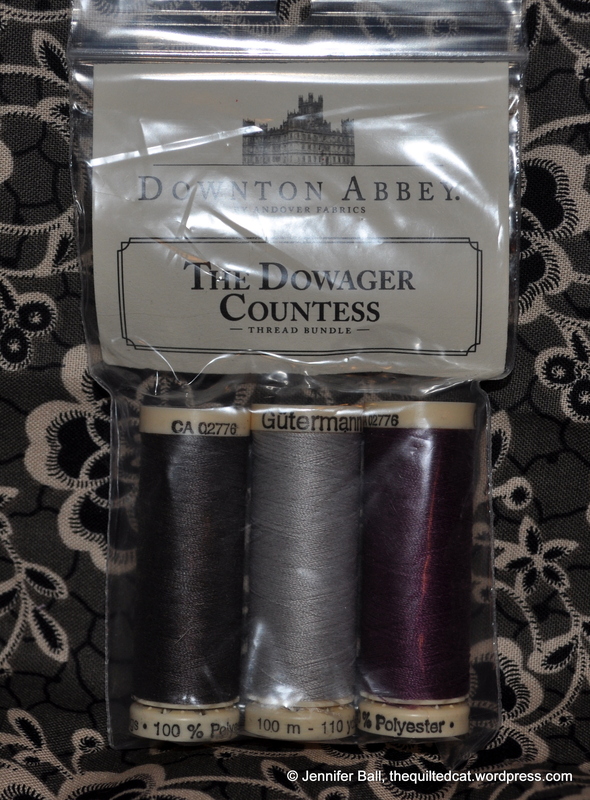 The prize is a pack of Gutermann thread designed to go with the Dowager Countess fabrics from the Downton Abbey collection. This set includes a plum thread (#942), a light grey thread (#100), and a dark grey thread (#112).